Ghost just released “Cirice,” the thunderous first single from their upcoming third album, Meliora. The record will be out on August 21st, and that will give you just one month to get ready for Ghost’s upcoming North American tour! Their Black To The Future Tour will kick off in Washington, DC on September 22nd, and will go all across the US and Canada before ending in Phoenix, AZ on November 1st. Tickets go on sale on Friday, June 12th, at 10 am local time. Purchased tickets will come with a redemption code to download a copy of Meliora a full 48 hours before its official August 21st release. Purson will be opening for Ghost during the tour. 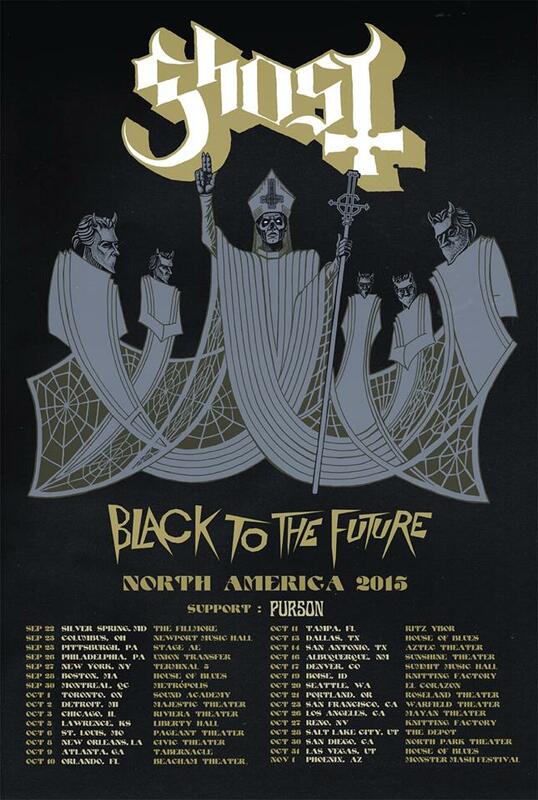 Ghost is an amazing band live, so you won’t want to miss them on their Black To The Future tour. Tickets go on sale this Friday at 10 am local time. You can also pre-order the new album, Meliora, on Ghost’s official store or iTunes and get an instant download of “Cirice.” Keep checking back here for all the latest Ghost music news.